Robert Kunz wrote in about his work titled "Modeling of Oxygen Uptake and Particle Deposition in the Human Lung using Homogeneous and Two-Fluid Models". 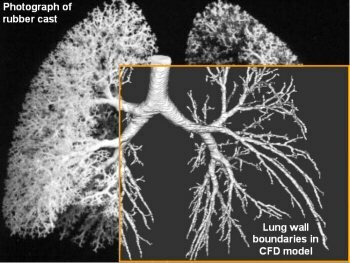 Researchers at Penn State University Applied Research Laboratory (USA), Center for Medical Diagnostic Systems and Visualization (Germany), and Image Processing Laboratory, Institute of Anatomy and Cell Biology (Germany), are using modern medical imaging technology and three-dimensional, time accurate mul­tiphase CFD to model oxygen uptake and particle deposition in the human respiratory system. A physically accurate representation of the trachea and most of the convective regime bronchi (up to generation 13) are obtained using high-resolution computed tomography (HRCT) of a rubber cast of an adult human tracheobronchial tree (Fig. 1). A triangulated model of this data is used as a bounding surface for hybrid unstructured meshes generated using the ICEM CFD 4.2 package. A parallel, n-fluid CFD solver, NPHASE, is employed in the analyses. The differential models employed are homogeneous n-species (n-gas constituents) and ensemble averaged n-fluid (gas+particle) systems. Specialized boundary conditions have been developed and applied at each of the more than 700 bronchi termini. These boundary conditions account for effective volume variation during a breathing cycle, O2-CO2 exchange, and diffusion range deposition. Convective and diffusive particle deposition models are also developed and applied for the resolved bronchi. The goal of this research is to evolve a complete simulation system for the human respiratory system, including detailed CFD analysis of the near-field external environment, gas-masks, inhalers, oral/nasal cavities and lung, including improved sub-grid deposition and pulmonary exchange modeling. This system will benefit: 1) medical practitioners in the assessment of respiratory performance of unhealthy individuals before, during and after treatment, 2) pulmonary drug delivery and protection gear system designers, 3) regulatory and WMD response agencies that need to assess short- and longer-term exposure to various environmental contaminants and toxins. Details of the particle deposition work were published at BIOMED 2003 (paper [pdf]). More recent results that include the oxygen uptake simulations will appear at the ASME Fluids Engineering Division Meeting in June 2004. Some animations of the unsteady simulations are available (anim. 1 and anim. 2).